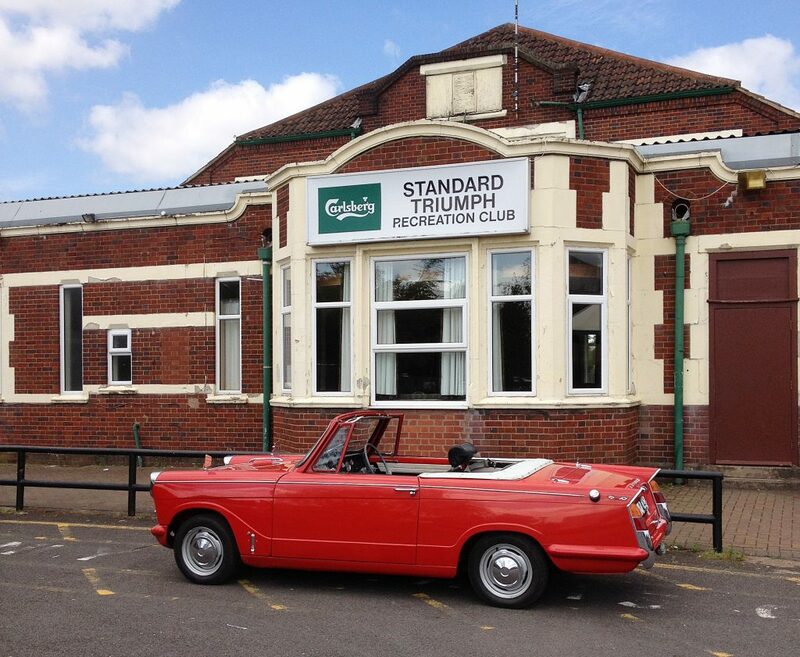 A Visit Back To Standard Triumph, Canley. 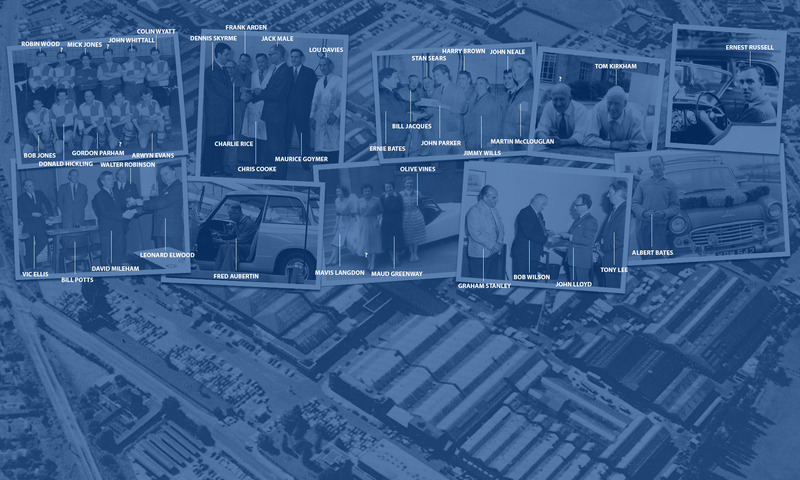 It has always been on the ‘bucket list’ to visit Coventry and, in particular, the site where the Standard Triumph factory once stood. 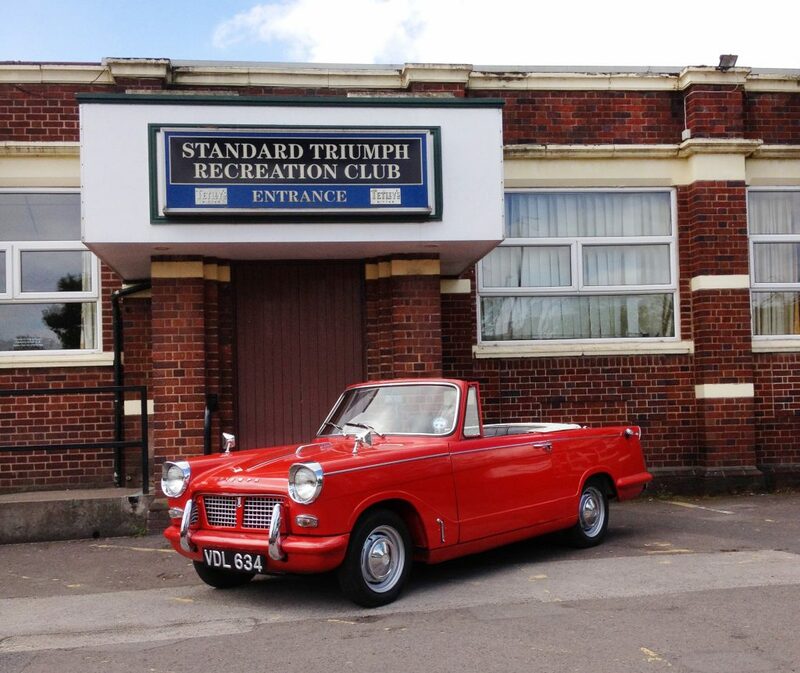 The site is now a retail park with a large Sainsburys, fast food outlets and offices however, amongst the newer builds one original feature still remains – the Standard Triumph Recreation Club – and it was this we wanted to see. Following on from a successful MOT pass, the ‘long way home’ seemed to include Brinklow and Coombe Abbey (photos to be added later) and a general potter about, roof down of course. At one point we passed a sign stating Coventry was (only) six miles away – so perhaps this could all of a sudden be the Triumph trip? We were, of course, the ‘wrong side’ of Coventry and so we needed to hop onto the Coventry ring road which isn’t really the best bit of planning/design – if you need to get on the ring road, it normally means a surge to the right, whilst those getting off surge to the left – with the entry/exit gaps not particularly long, so you kinda just hope for the best! Thankfully a quieter time of day and roadworks meant the dual part of the dual carriageway was down to a single lane. Happily no issues and, once the A45 was located we knew we were on the right track. We have to admit it was great driving a Coventry-built car through the centre of Coventry – there were numerous waves as we made our way through the traffic. The fabled Fletchamstead Highway and the right turn into the ‘old Triumph Works’ – we were welcomed by ‘Herald Avenue’ with other famous Triumph road names being a very nice touch – we have to admit a couple of times detour around the one-way system to ensure we headed for the ST club. Amongst the new offices we certainly stumbled on the Standard Triumph Club house and were able to have a good look around externally and get some photos, just with the mobile phone which was loosing battery power by the second! The building could be viewed three sides, with the fourth gated off with a bowling green. The facade of the building was identical to the period photos with painted (albeit a little flaky in places) blockwork and dark red brick – it was great to see! We parked up and took some photo, ever worried of the phone battery – we had come ALL THIS WAY, so unprepared! Fifty five years ago our little Herald was built, August 1960. (Original article from 2015 -Ed) After spending most of its life on the Isle of Wight (whereupon apparently it never left the island) and with subsequent later owners ‘down south,’ it is highly unlikely the car had ever been back to Coventry in all that time. Welcome home! With more recollections of his days and locations pointed out for entrances and satellite factories we chatted for a while until it was time to head home with one final stop off by the Standard Triumph monument, just a few yards away – photos and details of which we’ll post later. 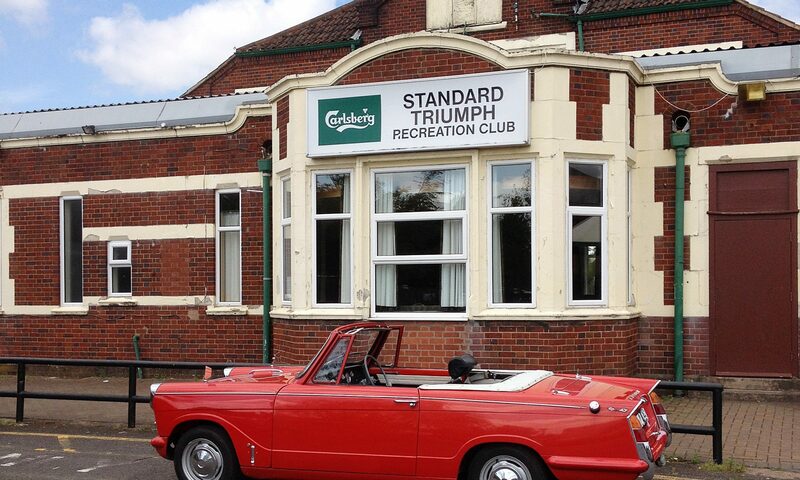 Driving past the MOT station that was half a mile from our house some, 55 miles travelled – 55 years between visits. A great trip, not only ticked off the ‘bucket list’ but one that must be done again soon!